What does it take to get someone to show you their most vulnerable parts, to get them to reveal them not just to you, but to themselves? George F. Walker’s new play, Fierce, gives us one kind of answer to that question. It’s also one of the best theatre experiences I’ve had in a while. This Criminal Girlfriends production is on at Rosemary Doyle’s rustic Red Sandcastle Theatre, which is just the right size and shape to frame this intimate, emotional, and often hilarious story. 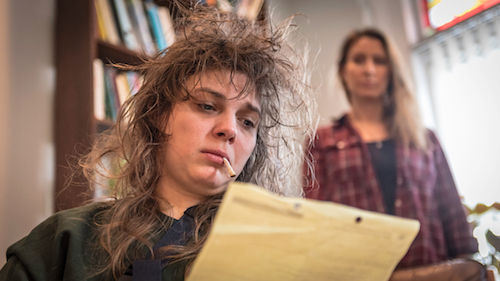 The show is a two-hander: Emmelia Gordon plays Jayne, an addict and convict whose recent drunken stroll down a highway has landed her in the office of a therapist, Maggie, played byMarisa Crockett. Maggie’s attempts to get to the heart of Jayne’s suicidal behaviour lead the two women into uncharted territory, straying far off the professional doctor/patient trajectory. Julia Kim’s set is simple – a run down therapist’s office, with worn furniture and various reference books askew, a table and lamp. And yet within this lacklustre space the two women engage in a struggle and a journey that has a life and colour and an emotional resonance that hooked me in and carried me along for the entire 70 minutes. Walker’s script is beautiful, and the humour of the piece arises partly from the contrast between Maggie’s rigidity and Jayne’s sarcasm, but also from the way these two women perform. There is an intensity to both characters, and Maggie’s pursuit of Jayne despite Jayne’s outright refusal to play the game the way Maggie wants is where the story gains not only its humour but its friction and momentum. Crockett and Gordon are magnificent: both are fully present and embody each woman with a presence and authenticity I don’t witness on a regular basis. The lighting is noticeable in a few ways – a disco ball reflects lights around a darkened theatre as the two sink into an acid trip together, creating a contrast that is both effective and funny. At other times the cues are executed less gracefully, and the dimming of the lights on a few occasions is a bit jerky and distracting, but that might be a function of old technology. I appreciated that Wes Berger’s direction focused on the dynamic between the two women and the struggle and moments of sympathy and recognition between them. The pace is excellent but there are actually places it could be slowed. The story has a life to it, one that is often fast-paced, but this kind of struggle also has room for painful silences that might help this extremely emotional dynamic to breathe more by offering up space for the audience to meet the story halfway, to allow us to anxiously await the next move.